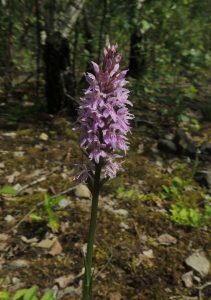 Dactylorhiza fuchsii is our native common spotted orchid and surely one of the most wonderfully variable orchid species you could come across. We have two of our seed raised clones in flower at the moment (above) which show the fantastic diversity in the species. 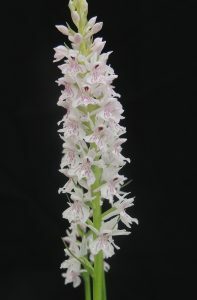 It is also common in remaining low nutrient unimproved limestone Mendip meadows and the nearby chalk downs of Wiltshire. 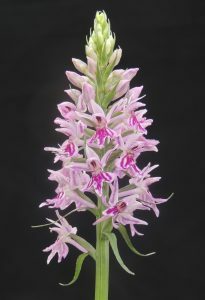 It is even growing in the school car park where it grows in subsoil between the rows of cars. 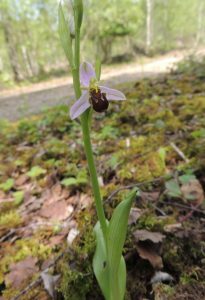 This bee orchid is flowering amongst the birch forest that has grown up in an area scraped clear of top soil ready for quarrying but never used.